–The African-American unemployment rate jumped up from its record low of 6.8% to 7.7%, another reminder of the volatility in these monthly numbers. 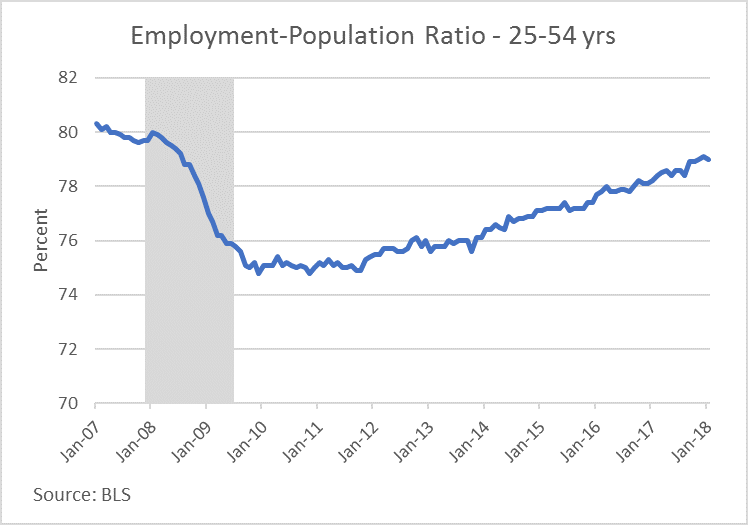 –The employment rate of prime-age workers (25-54) is an alternative metric of the strength of labor demand. Its peak was 80.3% in January 2007, and it eventually fell to a trough of 74.8%. Last month, it was 79%, meaning it has recovered 4.2 out of 5.5 percentage points, or about three-quarters of its lost ground. Whether this labor-demand proxy can continue to make back its losses (and more) is a key and hotly debated question. The figure below suggests a strong, ongoing response to the expansion, underscoring the more-room-to-run point. On the other hand, the series has been stuck at around 79% for the past five months, so it could be at its ceiling. –Job growth was solid across most industries with one notable exception being state government, down 11,000 last month and 39,000 over the past year. This may reflect budget squeezes still facing some state governments. –There were some weak spots in the report. 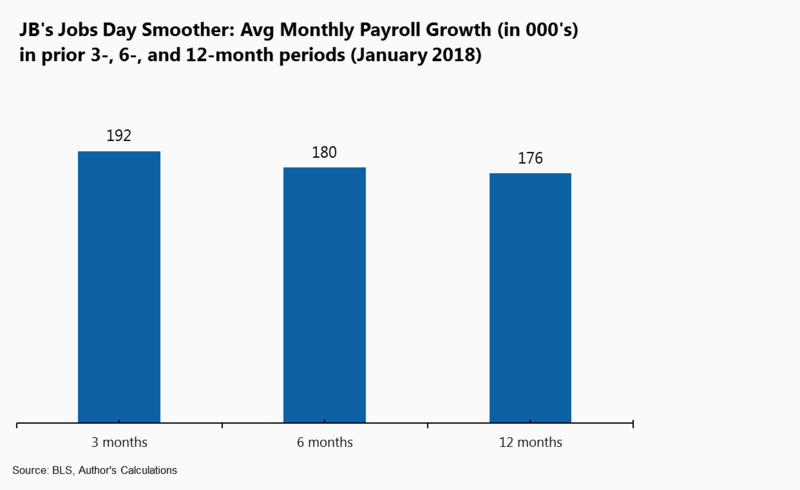 Wage growth for the lower-paid 80% of the workforce that have production or non-managerial jobs was up only 2.4%, implying that faster wage growth last month mostly benefited higher-paid workers. –Also, weekly hours pulled back a bit, leading to a 0.5% decline in total weekly hours in the private sector, an early measure of macroeconomic strength in the quarter. Turning to why faster wage growth is good news, consider these points. –People who depend on their paychecks rather than their stock portfolios, which is, of course, most working-age people, need a chance to make up lost ground. One place to see this is in the national share of income going to compensation, which took a big hit in the last recession and has yet to recover. –Don’t assume wage growth is inflationary. Productivity plus the Fed’s target inflation rate equals about 1%+2% right now, meaning 3% nominal wage growth is consistent with stable prices. But re-balancing the labor share of income—from profits to paychecks—is also non-inflationary. 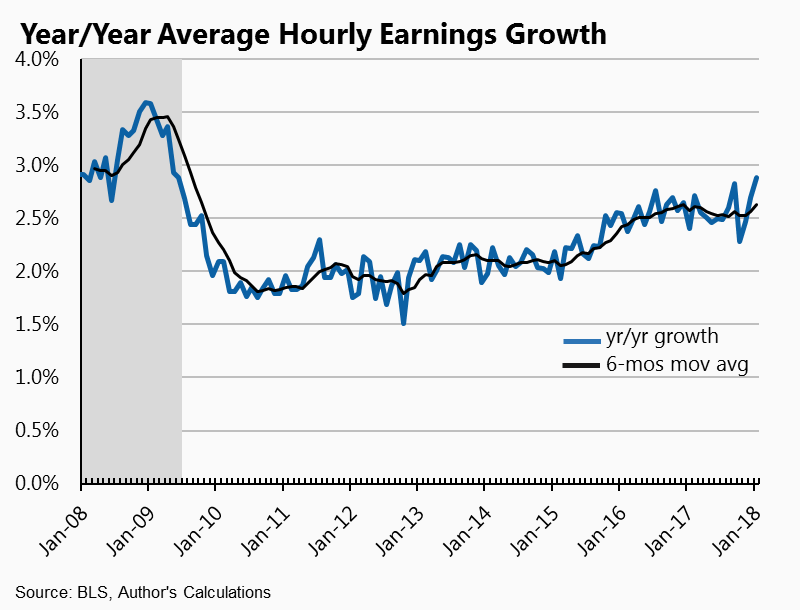 –Another thing you shouldn’t assume is that wage growth will automatically map onto price growth. That correlation has been very low in this economy. –One month does not a new trend make! 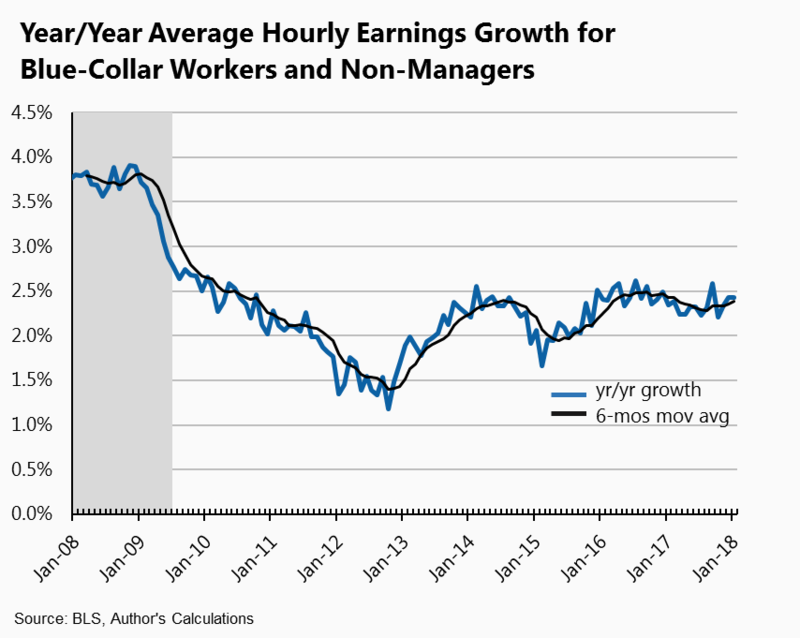 Check on the figures below, which show the trend in annual hourly wage growth for all private sector workers and for the lower-paid group noted above. The 6-month moving average is the right way to look at this, and it still looks pretty flat. That said, it’s true that some other wage series show a bit more acceleration, which is, of course, exactly what you’d expect at this point in the cycle! So, fear not wage growth, my friends, but welcome it with open arms…and patience at the Fed. Share the post "A nice wage pop in January should be welcomed, not feared!" 8 comments in reply to "A nice wage pop in January should be welcomed, not feared!" I always look here for the labor report explained, useful as always. Don’t we have an incoming Fed chair who is much more likely to fear inflation? I’m happy to see some shared views that increasing wages will not automatically cause inflation. However, I see no reason not to show the real increase vs nominal increase or maybe smaller graphs showing both or maybe an extra line on the graph. The absence of the graph showing the real increase which is 1/3 (1% of the 3%) to 1/5 (.5 % of 2.5 %) for the lower 80 percent is a questionable use of graphics (Tufte would not approve). Also although workers are doing better for the year, average earnings (hourly wages and hours worked) dropped last month $919 to $917 the figures are preliminary and the longer trend is still positive. Another point to make is that if 80% got 2.5 % and the average is 3 %, then someone got over 3 percent. Unfortunately because 80 get less than half of national income, the top 20 percent got more than 3.5 %. Here also is where real earnings become more significant. The real gains of the top 20 percent were not 1/3 larger (as in 3.5/2.5), there were 3 times larger (as in 1.5/.5). I’m shaking my head in disbelief that you’re ignoring this. I’m wondering if I’ve made an error. No I don’t think so. Upper middle class people just got three times the increase in wages last year, and you’re just letting this slide. I mean you told me the important info in the BLS about the 80 percent. Why wouldn’t one emphasize the widening inequality? Just how much more inequality is acceptable even if our poor are very well off compared to the world? How much faster than 3x the income gain would be reason for alarm? The highest quintile (top 20%) takes in about half of all income (see link below). This makes the math very easy. 1/5 people get half, 4/5 people get another half. A huge simplification of income distribution model thus shows the upper 20% earning 4 times the lower 80 percent To put it in dollar terms, average income in the US is about $70,000, and so one person makes $175,000 and 4 people make $44,000. This matches up not so badly with reality since median weekly for full time wage and salary employees was $854 or $44,408 a year. From here, the math gets even easier. If the top 20 percent have larger gains than the bottom 80 percent, then inequality increases instead of decreases. At the current rate in 25 years, the fictional top 20 percenter would make 5 times the income vs currently 4 times the income. Weekly earnings slip 1/4 a percent in January. Employment in lower paying jobs grows. But you won’t see this news anywhere. The liberal newspaper The New York Times is still largely an advocate for the current highly unequal income distribution. This is true even though it often runs stories about inequality and professes otherwise. And by unequal, I mean even just the near doubling of inequality in comparison to 1980. Couldn’t we just return to the Reagan era levels? This blog and the Times are essentially propaganda machines for Democrats and neo liberals and Clinton like views that would move a society towards one more equitable by small increments, rising tides, and few concessions to their rich liberal constituencies. Republicans and conservatives don’t deal in small increments, so the progressive movement is left in the dust, and the radical left seems to offer the only alternative. This discredits the left in general and makes them easy to defeat. How does one square the Times reporting “Wages have risen most quickly in lower-paying industries in recent months” with BLS showing higher paying jobs outpacing lower by 3 to 1? It could be the very bottom is rising, as in lowest 10 or 20 percent, because we already know average increase for the lower 80 percent was the opposite of “most quickly” Maybe the Times should change their words from “lower-paying” to “lowest-paying”? (Could also be less likely word twisting of lower-paying industries but not actually the lower paid workers, prob not) I think this blog also took note of the very bottom getting increases. Which of course means the rest of the 80 percent go less than 1/2 the percent average. Comments on the New York Times also pointed out that 18 states increased their minimum in January. It would be interesting to try and measure the effect, direct and also speculative ripple effect. Again, the story of good news in this economic data is largely fake news as it affects most Americans. You think the drop in hours worked is just noise and not the start of something? Re, the stock market. Wage growth numbers were just the match thrown on the gasoline and not the major fuel of the market drop. Investors have been very vocal about their concerns about a market bubble. Many were poised to sell at any indication of the bubble bursting. I bet that they did not rush out to buy 10 year Treasury Bonds. Short term, the market drop may be just a nervous reaction, hard to say how big though. There are plenty of long term issues to be worried about. However I wonder if investors will be happy sitting on cash very long. It could be that emotional factors may win over fundamental concerns. The addiction to big market gains may outweigh fear of a major recession anytime soon. Short term, I don’t see any financial crisis looming like in the last big recession. Consumer spending should keep accelerating with tax cuts and small wage gains. Mathematically, we could be due for a Return to the Mean correction. I did find it useful to understand what income groups are getting the most wage increases. Income inequality will continue be a disruptive political factor.